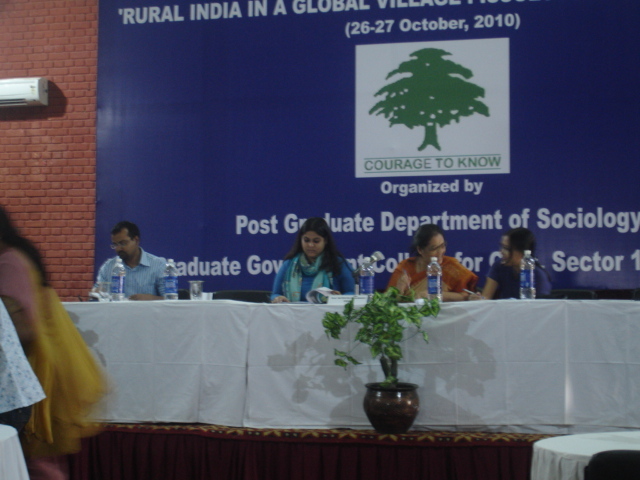 Rural India in a Global Village: Issues and Perspectives, a National seminar was organised by the Department of Sociology, PG Girls College, Chandigarh during 25-27 October, 2010. Prof. Yogendra Singh (JNU) delivered the keynote address and Prof. S.L. Sharma (Punjab University) offered a theoretical and methodological discussion on “Village Studies” in the era of Globalization. My paper in this seminar was on Globalization in India and Its Implications for the Poor. The post-Cold War project of globalization has had far-reaching implications for the established notion of democracy and development in India. Neo-liberal restructuring of the Indian economy in the 1990s has not only helped India to overcome what Raj Krishna had called “the Hindu Rate of Growth” but also to progress consistently with high rate of economic growth. It has also provided the Indian capitalists the opportunity to move beyond the boundaries of the nation-state. Indian stock market is rising; and India’s growth is attracting global capital in an unprecedented scale. The questions, however, are who are the beneficiaries of this growth process spurred by neo-liberal reforms? ; have the benefits of growth percolated down to the poor and the marginalized sections of society? ; and how has the entry of global capital affected the lives of the poor in India? Addressing these questions, the paper argues that (1) the neo-liberal policies of globalization has led to the decline of socialist/welfare state in India, which has adversely affected the economic interests of the poor and marginalized; (2) decline of the welfare state is a result of the changing state-society relation and the growing state-capital alliance; (3) contradictions of globalization have created conditions for political mobilization the poor (or what Karl Polanyi refers to as “the double movement”) that has pushed for redistributive reforms and social justice in India.